The genesis of Spikevision can be traced back to December of 1997. Due to certain unfortunate circumstances in my life at that time, I decided that I was in need of a different point of view. I pondered rose-colored glasses, and then their opposite. I came up with the concept of spike vision goggles. These goggles would penetrate the illusionary, happy, sine wave world that was placed before me. They would see the nasty, real, EKG-looking wave forms that constitute the way the world IS rather than the way it SEEMS. I was probably inspired by the sunglasses in John Carpenter’s “They Live”, but to tell the truth, I cannot remember if I was or not. 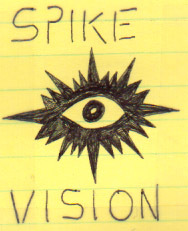 Armed with this design to work from, I created the symbol that now represents the concept of SpikeVision. I call this the Eyecon.